It's that time of the year when married couples and a few engaged ones across the country celebrate their relation. While it's mostly women who fast for their husbands and fiances, a few good men, too, believe in fasting for their wives. The whole idea is that a wife fasts for her partner's long life and well being. While women across the country celebrate the festival with utmost zest, Bollywood and television celebrities, too, are not far behind. They ring in the special day with their loved ones and break the fast in the company of their partners. In case you missed out, here are some of the best photos of how celebrities are celebrating the festival of Karwa Chauth. Ayushmann Khurrana, who kept a fast for his wife Tahira Kashyap, also shared an adorable photo with the love of his life. He captioned the photo as, "Fasting for you is fun. #KarvaChauth." 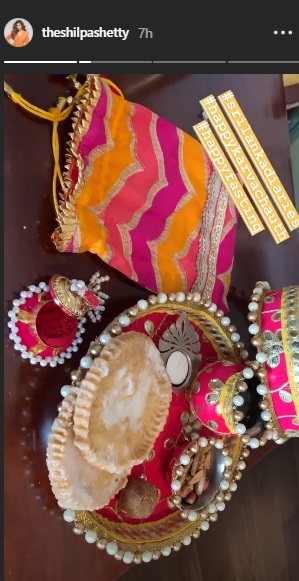 Shilpa Shetty, who is currently in Sri Lanka, also shared a glimpse of her colourful Karwa Chauth celebration. Sonam Kapoor and Anand Ahuja, too, celebrated their first Karwa Chauth together. They took to social media to share photographs of their adorable minimalist henna. Earlier in the day, Abhishek Bachchan also shared that all dutiful husbands should fast for their wife and revealed that he does too. "#KarvaChauth, good luck ladies.... And the dutiful husbands who should also be fasting with their wives! I do," he tweeted. From the television world, newlyweds Prince Narula and Yuvika Chaudhary also celebrated the day and dressed up in best of their traditional attires. Arjun Bijlani shared a series of photos with his wife on Instagram. "Happy #karvachauth to all u ladies who r fasting today but most importantly to you @nehaswami .jug jug ji."